We have been a fishing family for many generations. We are originally from St. Ives and this is why we always register our boats with the letters SS which is the registry for St.Ives. My great-grandfather, Ernest Stevens, was a very successful fisherman and he established us as fishermen boat owners back in the 1920’s. This is a picture of the Sweet Promise SS 95. She was built by Percy Mitchell in Portmellon (Mevagissey) in 1952. She was 50’ in length. She was built with a Kelvin 88hp main engine and a 44hp wing engine. My great-grandfather, grandfather (Boy Ernie) and great Uncle John (John Woolie) worked this vessel together. They fished for pelagic fish (sardines, herring and mackerel) using drift nets, ring net, and purse net, in the winter of 1956-57. 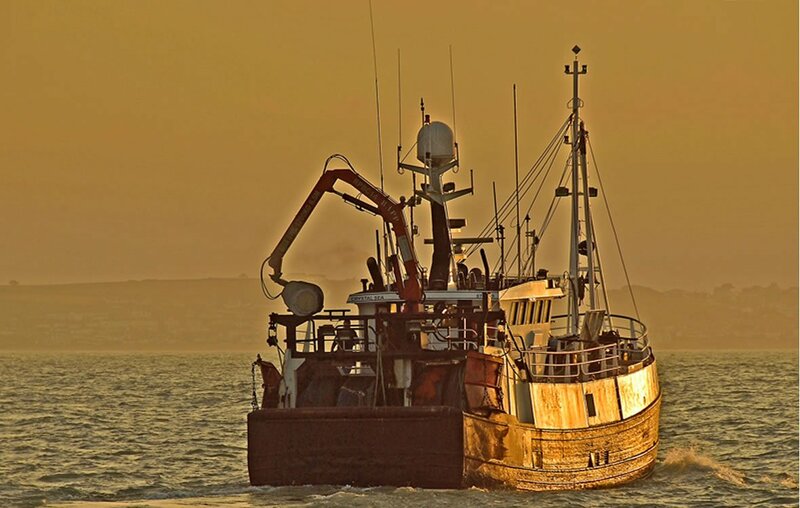 They were one of the first vessels in the UK to adopt the purse seine net method of fishing when they fished for herring in Dunmore, Ireland. In the summer months they would shoot long lines for rays, skates and other fish. In April of 1964 my grandfather Ernest Stevens (Boy Ernie, who I am named after) went out on his own and he built the Rose Of Sharon SS 118. This is the registration number we still use today. She was built by J&G Forbes of Sandhaven, near Fraserburgh, in Scotland. She was built with a Gardner 6L3B 150hp main engine. My dad joined his father aboard the boat in 1965. They fished the great lines, working west of the Scillies in the spring of the year catching skates and rays and other mixed white fish. Then in the summer months they moved to work the shore using the lines to catch blonde rays. In 1967 this vessel was hired to help clean the oil from around the Cornish coast after the Torrey Canyon ran aground on the Seven Stones Reef. In 1967 they turned to a new job in between working the great lines, which was stern trawling. In September 1969 the second Rose Of Sharon was launched. She was also built in Sandhaven by J&G Forbes. This vessel had to be registered in Fraserburgh FR 23 as she was longer than the previous boat being 65’ in length. My grandfathers skipper’s ticket only went up to vessels of 50 metric tonnes. In Scotland for some reason they registered lighter than in England, so to get her under 50 tonnes registered, he opted for a Scottish registry. 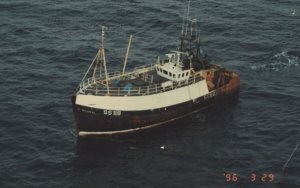 She was built with a 320hp Kelvin and was rigged for long lines and trawling. My dad worked the second Rose of Sharon with his brothers in 1970 after my Grandfather became ill. 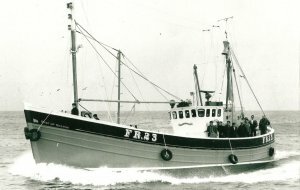 They did a couple of lining seasons but trawling became a more profitable way of fishing for us. They pair trawled in the winter for mackerel and sardines very successfully. In the summer they trawled for mixed whitefish. In the early 1980’s they started using hopper trawls which meant they could work grounds that used to be inaccessible. 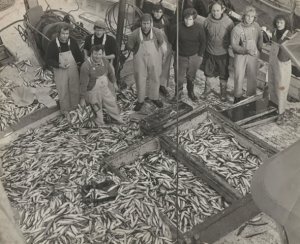 To the right is a picture taken in the early 1970’s of a huge 50 ton shot of sardines, whilst at the pair trawl. In the late 1980’s my dad decided to get another vessel to work alongside his brother who was now working the Rose Of Sharon. In 1989 we went up to Macduff in Scotland and bought the first Crystal Sea. We registered her to St.Ives with the number SS 118. She was rigged for stern trawling and white fish pair trawling. She was built by Macduff Shipyards in 1974 and was fitted with a shelter deck, a double net drum, 12ton trawl winch and power block. There was a 535hp Kelvin main engine and a 4-1 reduction Reintjes gear box and a 22hp Lister auxiliary engine. In 1990 I joined my dad on this boat followed by my brother Alec in 1992. We fished this vessel together for 18 years. Fishing went through some hard times in the late 1990’s but by the early 2000’s the fishing had turned the corner and we modernised this vessel extensively. By 2007 we were ready to step up to a newer vessel. In October of 2007 we went up once again to Scotland and we purchased the Crystal Sea II. She was another big step up and this was a purpose built stern trawler which was fully sheltered just open aft on the stern. She was built in 1989 by Macduff shipyards with a 650hp Caterpillar engine, a 250hp Deutz auxiliary hydraulic engine, 3 barrelled winch and two double net drums. She also had a 1.8 metre propeller in a nozzle, which gave us far greater towing ability and crucially she was set up to twin rig trawl which is the method my brother and I have adopted successfully on our grounds. This has been a great boat for our family. We have learned many new techniques and she has taken us further than we ever thought possible. We now land our catches to PTA, which has really benefited our busines by use of the internet auction opening new markets and maintaining and delivering a high quality product to our customers. In April 2016 We Purchased a replacement for the Crystal Sea II. The Crystal Sea III is a 21 metre steel vessel built at Macduff shipyards in 2009. This vessel is a purpose built trawler with a hull designed to achieve maximum efficiency whilst towing and optimum fuel consumption. She is fitted with the most up to date fish handling systems with conveyors from the hopper through to the twin washing system then down to the fish room. Once in the fully insulated temperature controlled fish room the fish is weighed and packed into 30-35 kg boxes, the vessel has her own ice machine so the fish is kept in optimum condition. We work 5-6 day trips to maximise the freshness and quality of our fish. The vessel is great to work with, she has the most up to date equipment throughout the boat and added extras for the crew comfort like WiFi, washing and drying machines and very quiet cabins! She is fully air conditioned, she also has a full length shelter deck so all operations are under cover, just to make the hard life we have at sea a little more bearable.